By Dennis W. Viau; modified from an Internet recipe. For this recipe I used an air fryer, a counter top appliance that uses hot air rather than oil to cook and crisp food. As alternatives, you could fry these potatoes in hot oil or arrange them on a rack on a baking sheet and bake in an oven. If you do not own an air fryer you can research the Internet (Google it) for recipes that use other cooking methods, such as frying in oil or baking in an oven. 1 tablespoon oil or fat, such as bacon fat (melted) or olive oil, corn oil, etc. Combine the spices and oil in a large bowl. Cut the potatoes into wedges, 8 per potato, and add to the bowl. 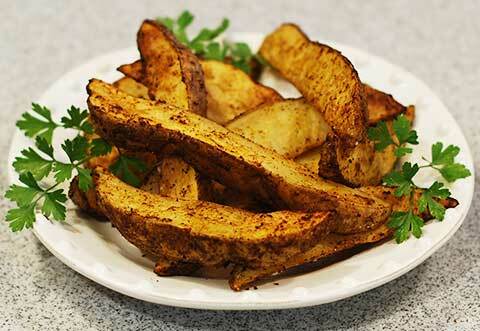 Stir and turn to coat the potato wedges with the seasoning mixture. Place the potato wedges in the basket of an air fryer (mine holds 5½ liters / almost 6 quarts). Set the fryer to 390°F (200°C) and cook for 20 minutes, turning the wedges in the basket halfway through the cooking time for more even cooking. Serve hot. You can include dipping sauces on the side.